That is quite a concept, isn’t it? Sometimes we get blinded to the fact the things we do today can affect tomorrow adversely and painfully. In other words, creating a comfortable but unwise present can sacrifice tomorrow’s future. A story is told of a dog walking across a bridge with a bone in his mouth. When he looked down into the river and saw his reflection, he thought it was another dog with a bigger bone. He jumped in the river to get it and drowned. Jealousy and envy based choices have consequences. That dog sawed off the limb he was sitting on. Here’s another story that illustrates the point I’m trying to make today. An elderly woman died recently. Having never married, she requested no male pallbearers. In her handwritten instructions for her memorial service, she wrote, “They wouldn’t take me out while I was alive, I don’t want them to take me out when I’m dead.” Her disappointment and bitterness were a ‘lose-lose’ for everyone. Now older women were going to have to carry her coffin. As Jane Austin would say, that would be a “most disagreeable alternative” for everyone. Suddenly, in a shrill scream, “Hey, what’s with you? This bird’s only got one leg.” The pet store owner was perturbed, “Lady, what do you want, a singer or a dancer?” Isn’t it a shame that she couldn’t see the miracle because of her ungratefulness and extravagance? 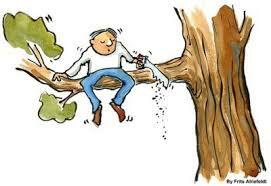 Remember, when you are out on a limb, try not to cut yourself off from the very thing that is holding you up. You see this concept in action time and time again in families and marriages. Many times the ones who love us most are the ones from whom we cut ourselves off. That is like winning the battle but losing the war. To do that is to oppose yourself. Finally, today many are cutting God out their life and lifestyle. Please don’t do that. God is the ultimate Father who will never leave you or forsake you. Don’t let envy, bitterness, ungratefulness, or extravagance cut you off from the One who loves you the most. That is a most disagreeable alternative indeed.